Spearheaded by Buffalo Bayou Partnership and Central Houston, and the result of a nationwide design competition led by Rice Design Alliance, the 22-acre park was established in 1986 to commemorate the 150 year anniversary of the founding of Houston. 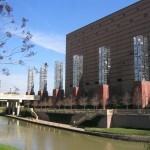 This urban park flanks Buffalo Bayou as it flows past the Wortham Theater Center in the heart of Houston’s Theater District. Among the outstanding features located in the park are: 24-foot Allen H. Carruth Promenade, Baker Common, 250-foot boat dock and gardens and an historic photographic display. Flanking the park’s promenade and Preston Street Bridge, the 70-foot tall pillars highlight Houston’s history through the themes of agriculture, energy, manufacturing, medicine, philanthropy, technology and transportation. Each column is constructed of 150 individual children’s drawings, etched in stainless steel plate. After reviewing Buffalo Bayou Partnership’s master plan for increasing aeration in the bayou, Dean Ruck conceived the Big Bubble and won a national competition for projects to be included in Sesquicentennial Park. Visitors can see (and hear) the “Big Bubble” by walking over to Preston Street Bridge and pressing a red, unlabeled button located on a pillar facing southeast. Serving as our nation’s 61st Secretary of State, James A. Baker III led the U.S. in foreign affairs during a pivotal time in history – the end of the Cold War. Baker, a Marine Corps veteran and partner at the law firm Baker Botts, served in three presidential administrations as Secretary of the Treasury, Secretary of State and twice as White House Chief of Staff. This statue by Chas Fagan was dedicated in October 2010. The George Bush Monument, a tribute to the 41st American president, was unveiled to the public in 2004. The exhibit features an eight-foot bronze sculpture by Chas Fagan of the former president and a semicircular wall consisting of four bas-reliefs by Houston artist Wei-li “Willy” Wang that depict President Bush in various stages of his life—President Bush as a Navy pilot in World War II, as a Houston oilman and member of Congress, with Mikhail Gorbachev in managing the peaceful end of the Cold War, and with wife Barbara attending the Inaugural of their oldest son as 43rd president. Designed as a pedestrian link to the bayou’s east and west banks, the Preston Avenue Bridge is lined with wide sidewalks and replicas of the historic lighting that once adorned this early bayou crossing.